By carrying my children I felt connected to women all over the world, through the ages and in different cultures who have done the same. It seemed the most natural way to move from place to place with a young baby as I was able to smell him, feel his body against mine, listen to his sounds, talk to him. He could see what I could see and be involved in my interactions with the world. I knew straight away when he was hungry and could also feed him while in the carrier if necessary. 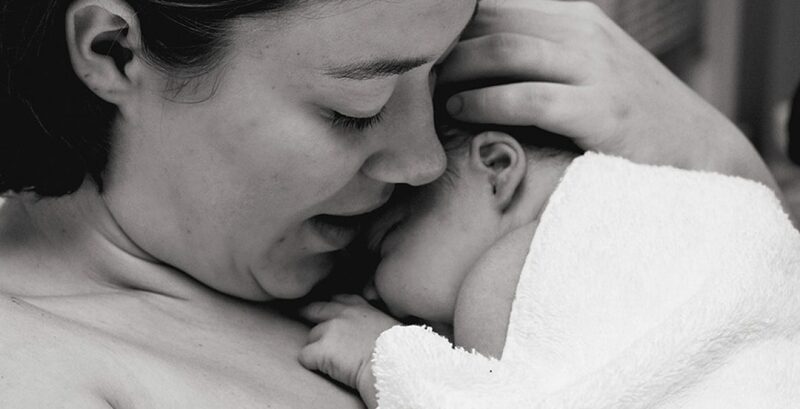 He didn’t need to cry to get my attention and he could sleep cuddled up against my body, where he felt safe and relaxed, not to mention soothed by my movements and heartbeat, which resembled what he felt in the womb. I used a number of different baby carriers, particularly with my first child (now 10), when I was part of a babywearing group in Brighton, England, and inspired by the variety of types available. Later, with children 2 and 3, I narrowed my choices down to what seemed the most practical for my needs at the time. There are many varieties of baby carrier available and I encourage you to try out different types to see which you find most comfortable. The important thing to consider, as well as how supportive it is for you, is that it allows you to carry your baby in an ergonomic way. Your baby’s body should be in a spread squatting position, wrapped around you, with the legs in an ‘M’ position, supported as far as possible up to the knees. I was gifted a Loopi by my Israeli cousin when pregnant with baba number one. It was a great present and I would recommend it to any new parent. It behaves very much like a stretchy wrap but is made of two loops of strong, soft, stretchy fabric, which you cross at the front and back to support your back and the baby. I found it really comfortable and snuggly to wear when my babies were little. Because it doesn’t require any tying or dealing with metres of cloth, both my husband and I found it really easy to use. When the baby is not in the carrier, you can keep the loops around your waist or in the bag. It folds down small, so is easy to carry around. By about five months however, I found the stretchy fabric bounced too much with the baby’s weight and I moved on to using something with less give. Now, the same company makes a similar carrier that is connected at the back so it is just a single piece of fabric. They call it the Loopix. I haven’t tried it out as my Loopi has lasted so well (I have used it over ten years, washed it numerous times, lent it to other families and still it is in great condition). But the Loopix looks good and I imagine it is as comfortable and convenient as (if not more than) the Loopi. 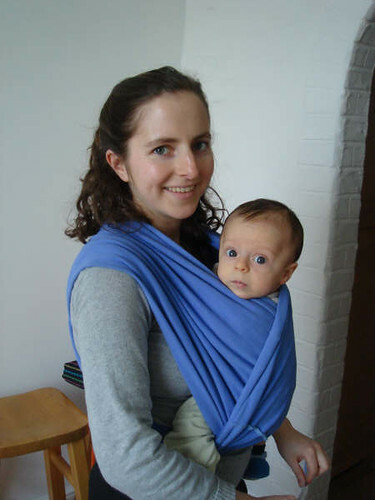 The woven wrap, of which their are many beautiful brands, is one of the top choices of any babywearing enthusiast. Not only is it extremely supportive for both adult and baby, but there are so many different ways you can tie it in order to carry baby on your front, back or hip. Because of the strength of the fabric, you can carry a child from newborn up to toddler. I used my woven wrap a lot with my first baby. I bought a Girasol wrap second hand, so it didn’t cost me a huge amount. There are many different beautiful fabrics available, so if you like pretty things, you can have a ball. Once you are finished carrying your babies, you may be able to pass or sell it on to someone or use the fabric for something else. I have to admit that when number two came along, I generally opted to use the Manduca (see below) once he’d grown out of the Loopi (above) as I found it really convenient and didn’t feel like managing the long length of fabric while also caring for my then three year old. I have to say, that while I love the softness and simplicity of the soft fabric wraps, the Manduca, a soft, structured buckle carrier, is the one that has had the most use in our family over the last ten years and has thus ended up the most battered. Thanks to the simple newborn pouch (an added piece of fabric that is sewn into the body of the carrier), you can carry a tiny baby in the Manduca with no extra inserts. The body of the carrier can be extended allowing for extra support for young babies or to fully support a toddler’s back. The thick padded straps and wide hip belt make it very supportive for the wearer. 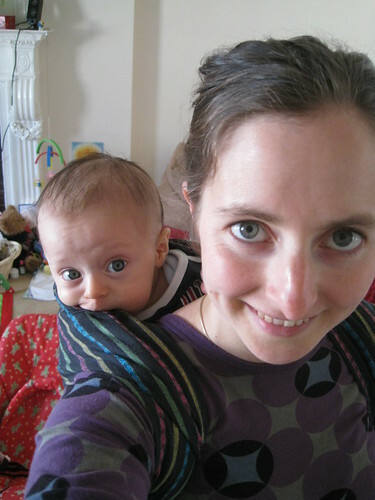 I particularly like the fact that you can cross the straps at the back when the baby is in the front as I found this much more supportive than rucksack style straps. My only one complaint about the Manduca was that the hood (which supports the child’s head when asleep) was quite small and not as supportive as I would have liked. It is possible that the design has been improved though, as I bought mine some time ago. My kids all enjoyed being carried on our backs up until toddlerhood and because of the simple strap and buckle system, it is super quick to get them in and out, on and off. 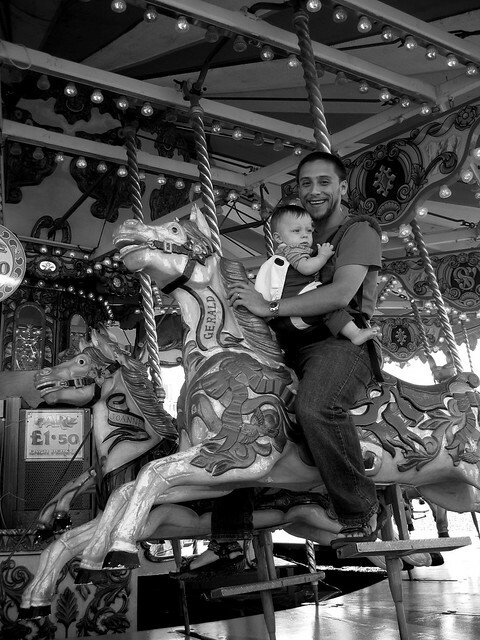 Dads often seem to like the buckle carriers because they are simple to use. There are many babywearing sites online that discuss both the safety and choices around babywearing including Babywearing International and Baby Sling Safety. as well as online shops to buy carriers new or secondhand. There is also a Babywearing Portugal Facebook group. If you want to know more about the benefits of babywearing or need help making sense of the wide range of carriers available, drop us a line.